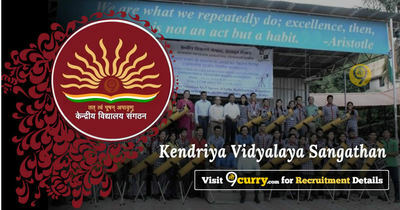 KVS TGT, PGT, PRT, Librarian Admit Card 2018: Kendriya Vidyalaya Sangathan has issued the Admit Card on 30 Nov 2018 for KVS TGT, PGT, PRT, Librarian Exam 2018. KVS TGT, PGT, PRT Exam Date 2018: Kendriya Vidyalaya Sangathan has announced Exam for PGT, TGT, Primary Teacher & Other Posts (KVS) will be held from 22 Dec 2018 & 23 Dec 2018.
i) Master Degree from a recognized university with at least 45% marks in aggregate. (i) Persons holding analogous posts or posts of Principals in Central/ State Govt./ Autonomous organizations of Central/ State Govt. in the Pay Level-12 (₹78800-209200). (ii) Vice-Principal/ Asstt. Education Officers in Central/ State Govt./ Autonomous organizations of Central/ State Govt. in the Pay Level-10 (₹56100-₹177500) with combined services of 05 years as PGT and 02 years as Vice-Principal. (iii) Persons holding posts of PGTs or Lecturer in Central/ State Govt./ Autonomous organizations of Central/ State Govt. in the Pay Level-08 (₹47600-₹151100) or equivalent with at least 8 years' regular service in the aforesaid grade. (iv) 15 years combined regular services as TGT in the Pay Level-7 (₹44900-₹142400) and PGT in the Pay Level-8 (₹47600-₹151100) out of which 03 years as PGT. (i) Masters Degree from a recognized university with at least 50% marks in aggregate. (ii) B.Ed or equivalent teaching degree. 10 years combined experience of working as PGT or Lecturer and TGT in Central/ State Govt./ Autonomous organizations of Central/ State Govt. of which at least 3 years should be of working on the post of PGT or Lecturer. (a) Two Year Integrated Post Graduate M.Sc Course of Regional College of Education of NCERT in the subject concerned. Master's Degree from a recognized university with at least 50% marks in aggregate in the relevant subjects. PGT (Computer Science) i) At least 50% marks in aggregate in any of the following: B.E or B.Tech (Computer Science/ IT) from a recognized University or equivalent Degree or Diploma from an institution/ university recognized by the Govt. of India. 'C' Level from 'DOEACC' Ministry of Information and Communication Technology and Graduation. Bachelor's Degree with at least 50% marks in the concerned subject/combination of subject and in aggregate. i) B.Ed or equivalent degree from a recognized University. ii) Pass in the Central Teacher Eligibility Test (CTET) Paper-II, conducted by CBSE in accordance with the Guidelines framed by the NCTE for the purpose. i) Three years Diploma after Higher Secondary In Electrical. Electronics Engineering from an institution recognized by State Govt.I Govt. of India. (The minimum qualification for admission to the Diploma Course should be at least Higher Secondary). Bachelor degree in Library Science OR Graduate with a one-year diploma in Library Science from a recognized institution. ii) Qualified in the Central Teacher Eligibility Test conducted by the Govt. of India. its equivalent and Bachelor Degree in Music or equivalent from a recognized University. On the basis of Test. Eligible candidates may apply online at KVS's website (direct link is given below) from 24th Aug 2018 to 13th Sep 2018 till 11:59 PM. Go to "Homepage" & Select the desired post.